NEW YEAR’S RESOLUTION UPDATE: A LOOK AT SOME WATERMELON EATING CHAMPIONS - What About Watermelon? Compared to previous years, which included competing in a watermelon seed spitting contest and growing my own watermelon, my New Year’s resolution this year is pretty simple: Enter a watermelon eating contest. Essentially, my resolution is to eat a whole bunch of watermelon. How hard can it be, right? Actually, the hard part isn’t eating the watermelon, but finding the contest to enter. Like the seed spitting contest in 2012, it’s not something that happens all that often up here in the northern states. I’ll write more about finding a contest in a future blog entry. For now, I’d like to focus on the fun part of this challenge – the eating. 1. “Buffalo” Jim Reeves – According to the International Federation of Competitive Eating, Reeves set the current watermelon record by eating 13.2 pounds of in 15 minutes on July 30, 2005 at the “Swellin’ with Melon Watermelon Eating Championship” in Brookville, OH. To be honest, I’d be happy if I could eat half that amount! 2. Elephants – Earlier this year, eight members of the Southwestern College (San Diego) football team faced off against two Asian elephants to see which side could eat more watermelons in a 15-minute period. 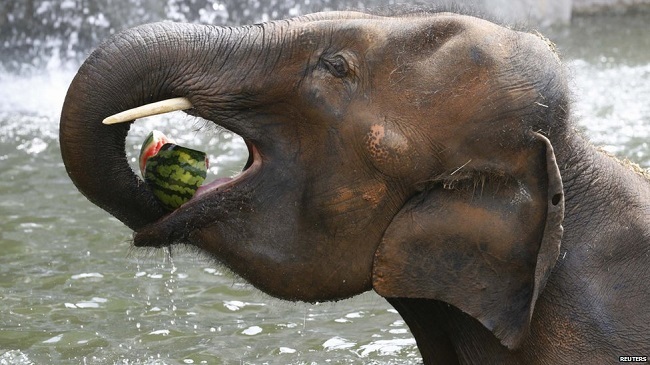 The football players ate eight watermelons, but the elephants downed 10 to take the title. 3. “Crazy Legs” Conti – On May 20, 2008, pro eater “Crazy Legs” Conti at 15.1 slices of watermelon in six minutes. Sounds pretty impressive, but it’s hard to say how big the slices were. 4. “Furious” Pete Czerwinski – On May 30, 2010, Czerwinski ate an amazing 34 slices of watermelon in three minutes in a contest at the Mardi Gras Casino in Hallendale Beach, Florida. As you can see, the bar is set pretty high when it comes to my future watermelon eating performance. Luckily, I only need to compete in a contest in order to accomplish my resolution – I don’t need to win the contest. That’s good news, because I really like watermelon and I might actually try to savor it during my future eating contest appearance! Hah! I bet the elephants vs. footBall players would have been a hoot to watch. I imagine the elephants enjoyed their leisurely snack while the boys crammed watermelon down this throat. Thanks for including link so we can read the story. Good Luck Finding and Winning a Watermelon Eating Contest. Thanks everyone! Hopefully I find a contest that doesn’t require me to face off against elephants!